This week I had the fabulous opportunity to speak at the CIPR Inside Annual Conference #ClosingTheGap16. A jam packed day where 200 internal communication professionals gathered to exchange ideas and experiences about employee engagement, employer branding and leadership. My session focused on closing the gap between brands – the corporate brand, the employer brand and the often overlooked employee brand. Customers no longer complain on the phone – they take to Twitter for everyone to see (including my little rant at HP about their ink cartridge fiasco). Potential employees no longer trust what a recruiter has to say – they ask people they know and check out to Glassdoor.com. Employees have become so much more than a workforce. Collectively they deliver the customer experience. Yes, employees should be able to articulate the brand story, but most importantly explain how their role contributes to it...their purpose. As we move towards digital transformation, transparency of information and an ever global marketplace, organisations need to understand the power of putting employees in front of the logo. When businesses unify their corporate, employer and employee brand they attract best-fit customers and talent which in turn reduces cost, improves productivity but ultimately strengthens the brand experience for customers. The Edelman Trust Barometer clearly advocates that authenticity and credibility are now the drivers of trust when it comes to purchase decisions. 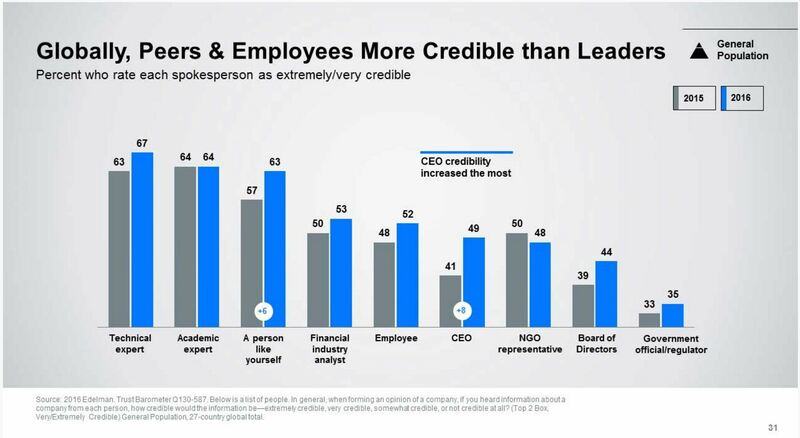 Folks that hold the purse strings are heavily influenced by technical experts, people like themselves and employees of a brand more than they trust leaders of the brand. So, what's the answer? Well, its' not a quick fix. First, recognise that this is a cultural shift and not a project. Get the right people around the table (HR, Internal Communication, Marketing, Social Media team, Leadership) and agree the direction and purpose of change. Also agree the goals and objectives up front. Look at existing measurements such as the Net Promoter Score, the employee engagement results, employee attrition rates, cost per hire - look at existing business measures and monitor changes on existing measures. Second, start connecting people across the business. One fantastic example from the#ClosingTheGap16 event came from Emma Savage and Emily Lovell at Powys County Council. 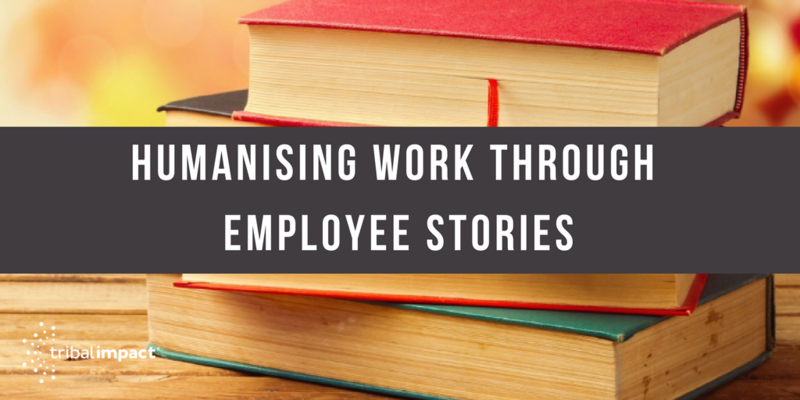 Leaders within the organisation started “trading places” with their employees joining them for a day in school kitchens to cook meals and on the refuse collection runs. How impactful can you get? A Chief Executive baking cookies with his team and serving lunch to his future customers (school kids). The presentation from Curtis James really struck a chord with me. Curtis studies humans at work. He spends the day photographing and observing employee life. His hugely powerful presentation highlighted different attitudes to work but more than that, the humans behind work. 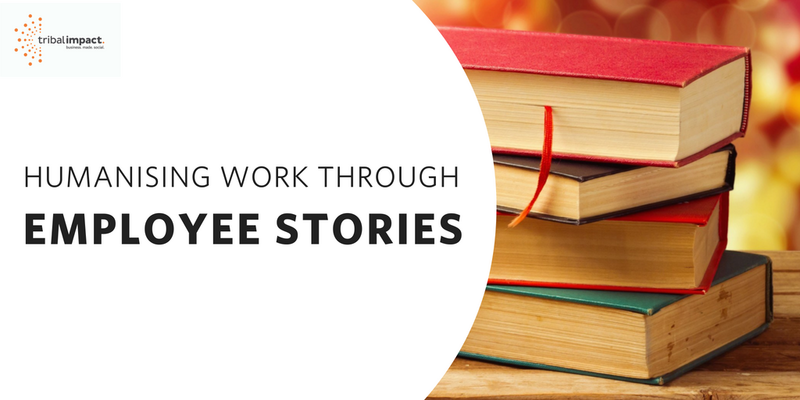 He spent some time with Abel and Cole (an organic food delivery company) to discover employee stories highlighting how their role supports the customer experience. Focusing on a potato order (which is where it all started for Abel & Cole) they followed the order from website to delivery. Curtis interviewed employees that interacted with the customer order at each stage of its transaction journey. One order. One customer. One common purpose. Brilliant. You see, when businesses start to explore their identity and purpose. Storytelling positively impacts their recruitment strategy, their training philosophy but ultimately the customer experience. I’m a huge advocate of showcasing talent that sits within a business. It brings a brand to life and makes brands more human. Under suits and uniforms are stories. Colourful experiences that shape people into who they are. Unique individuals that collectively contribute to what makes a brand unique. For me, this is what being a social business is all about. Having the confidence to let your employees become the lead voice when it comes to branding. Recognising that the workforce isn’t just there to do a job, but actually create an experience both for them and for the customer. When Have You Felt Purpose As An Employee? During my last few years at SAP I felt complete purpose. I felt excited for the company, the direction it was taking, the leadership direction we had and I knew how my role contributed to digitally transforming the business. I’m curious, can you think of an experience where you have felt purpose in your role? Where you understood the contribution your role was making overall? Was this company wide or driven more by your immediate line manager? Drop a comment below - be good to read some stories. Read what our team are saying about the latest social business and employee advocacy news. Even more insights here. At Tribal Impact, we work with large and small organisations to activate their employees on social media - from coaching leadership to enabling sales to creating expert influencers. We join the dots between Content Marketing, Social Selling and Employee Advocacy.